An Arctic Adventure is a dream trip for many of us. But if you’re anything like me you have more questions than answers. It is after all one of the remotest regions of the world, one which few travellers will ever be fortunate enough to visit. 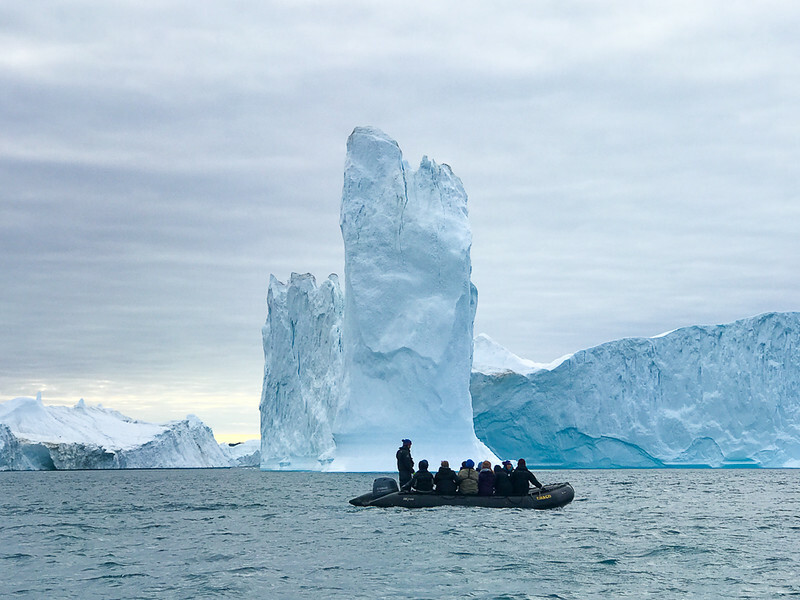 This Arctic adventure is perfect if you’re interested in discovering the natural history of some of the planet’s most striking features. And if you want to learn about the cultures and wildlife of the vast and beautiful north. You’ll increase your Arctic wildlife sightings considerably by spending more time outside. Resist the urge to snuggle in your cabin. I really enjoyed my time outside even when I didn’t spot wildlife. Arctic silence is like nothing I’ve ever experienced. It brings peace and a connection to nature that you’re not going to get from being inside. Travel Tip: Invest in a pair of binoculars if you don’t already own a pair. Highlights: The journey is finally starting after much anticipation. Excitement on board is high as guests mingle and get to know each other. Highlights: Getting a glimpse of what life is like in Greenland in such a harsh climate and remote place. It’s a soulful visit that had me reflecting on how different my own life is. Highlights: Humpback whales, Ilulissat Icefjord, and being able to hike on my own in such a vastly different landscape. 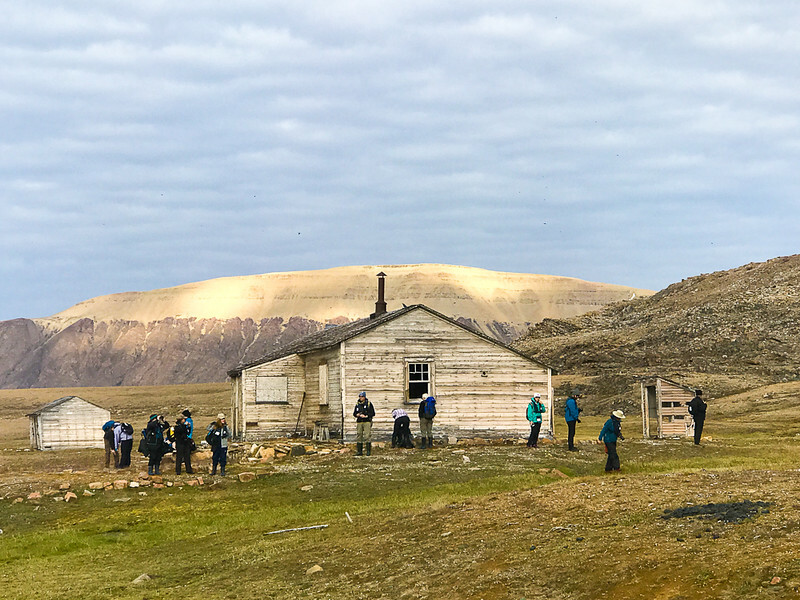 Highlights: Visiting one of Greenland’s most important archaeological sites and learning how the mummies came to be by the archaeologist. Highlights: Exploring a place that no one on board (including the crew) has visited. I loved not knowing what we’d find or what critters we would meet. Highlights: Enjoying the Arctic silence and crisp Arctic air. Highlights: Meeting the friendly locals in Pond Inlet, learning about Inuit humour and of course the polar bear sighting. Highlights: Learning about birds from the ornithologist in our zodiac. I’m not as knowledgeable about birds as I’d like to be and found it very interesting. Highlights: Narwhals, a polar bear, and Arctic foxes within hours of each other? Mind-blowing. One of THE best wildlife days of my life. Highlights: Visiting Beechy Island, spotting the pregnant polar bear, and doing the polar bear plunge. It’s also a significant investment. What you want to know is it really worth it and what to expect. You want to hear about the good and the bad. As a result, I’ve broken down my recent Arctic Safari with Adventure Canada. Day by day, including total wildlife sightings, and days when things didn’t go according to plan because of icebergs or thick sea ice. I loved my adventure so much that I’ve partnered with Adventure Canada to offer it. But I’ll always be 100% honest with you, so ask me anything. This classic Arctic expedition is offered once a year (August 6th – August 17th, 2018). The 12-day trip begins by exploring Greenland’s fords and communities. The massive ice fjord at Ilulissat, a UNESCO World Heritage Site is one of the Greenland highlights. 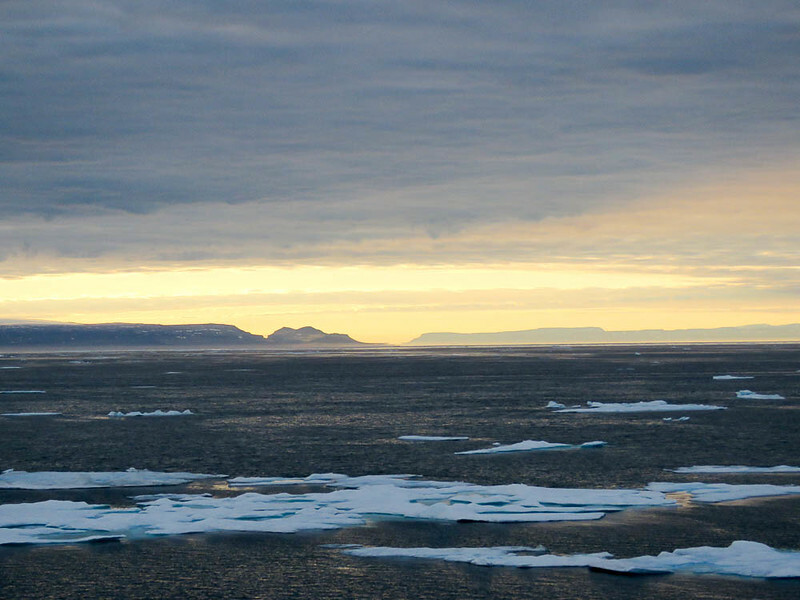 Across the Davis Strait, the Canadian Arctic experience begins in the friendly community of Mittimatilik (Pond Inlet). Along the way, you learn from an impressive of onboard experts. 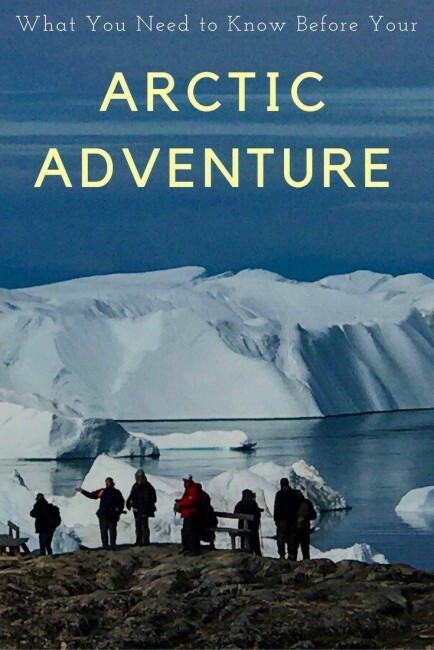 My 2017 expedition included World Wildlife Fund representative, Arctic explorers, authors, Inuit experts, a botanist, a geologist, a whale expert, a historian, and photographers. Many of these experts were multi-talented with overlapping interests. As you head north, you’ll be on the lookout for polar bears, whales, and muskox on Devon Island and throughout Lancaster Sound. Birders will love Prince Leopold Island, one of Canada’s best birding areas. A visit to abandoned RCMP and Hudson Bay Company posts give you a glimpse into the region’s rich history. At Beechey Island, you’ll pay your respects at the graves of three of Sir John Franklin’s men. Resolute Bay memorializes the courage of the Inuit of Canada’s Arctic. Below you can see our exact route for 2017. It’s subject to change due to icebergs or thick sea ice, but the general route stays the same. Guests on board are kept up to date each day with what’s happening and any changes. The route of our Arctic Safari. What can you expect to see on your Arctic adventure? The chart below shows exactly what we saw. It will invariably be different on every trip. Also worth noting that I didn’t see everything listed below. Some sightings are really quick. For example, only a couple of people saw the Bowhead whale. It disappeared almost immediately upon the sighting. 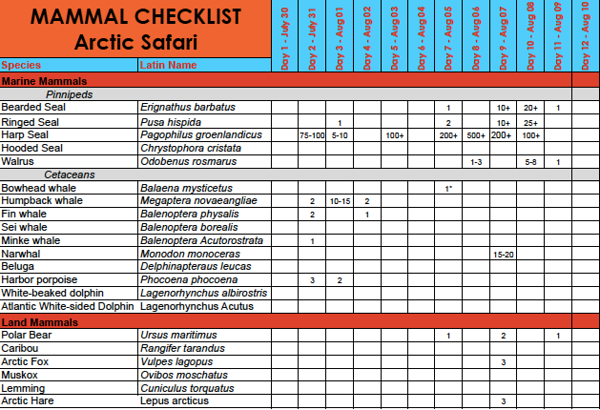 List of mammals we saw on our Arctic Safari. After a 4 ½ hour flight, we arrive in Kangerlussuaq, Greenland’s main airport. Then it’s a 20-minute bus ride from the airport to the harbour. And then a 5-minute zodiac ride to the ship. The ship departs after dinner. We travel 265km overnight along a long fjord and past the U.S air base used in World War II. We start the day with a visit to Greenland’s second largest city with ~ 5500 inhabitants. And 1000 Greenlandic dogs. The name means Fox Hole. We’re now 75 km north of the Arctic Circle. 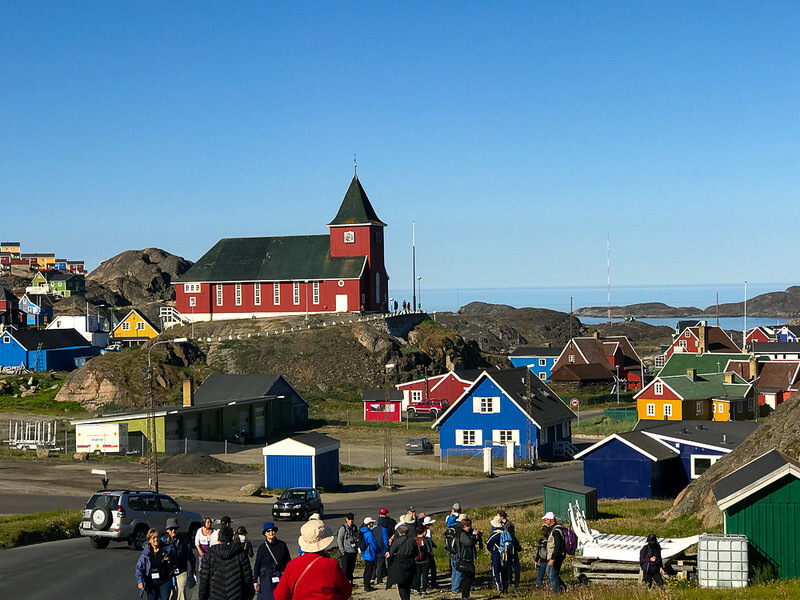 Sisimiut is a picturesque place with colourful houses. The first thing you’ll notice about Sisimiut is the colourful houses. They pop against the dull rocks. A Greenlandic dog who is resting for the summer. In previous times they were colour coded according to their function. It was a cheerful, yet pragmatic way that the Greenlandic Inuit and the Danish could communicate. Commercial houses were red; hospitals were yellow; police stations were black; the telephone company was green, and fish factories were blue. Accordingly, people also lived in the same colour house that they worked. So if they worked at the fish factory, they also lived in a blue house. There is an optional free guided tour (which I highly recommend). And then you have several hours of free time. You can have lunch back on the ship or in town (at your own expense) and explore on your own. I enjoyed the freedom and flexibility this day offered. It’s an early start today – a 6:00 am wakeup call to get the best light. The minute we were on the water I didn’t mind, admiring the icebergs that dot the landscape. The day starts with a 90-minute Zodiaciac ride exploring the Ilulissat Icefjord. Within 5-minutes we saw a large pod of humpback whales who got quite close. Our presence didn’t seem to bother them. They were too busy hunting in the nutrient-rich waters favoured by fish. Fortunately, they hung around for ~ 20 minutes until their appetites led them out of sight. The distraction (if you can call them that) of whales gone, it was time for the icebergs to play a starring role. Ilulissat is home to some of the world’s fastest moving icebergs. It’s also a UNESCO World Heritage Site. The icebergs are estimated to be approximately 20,000 years old. 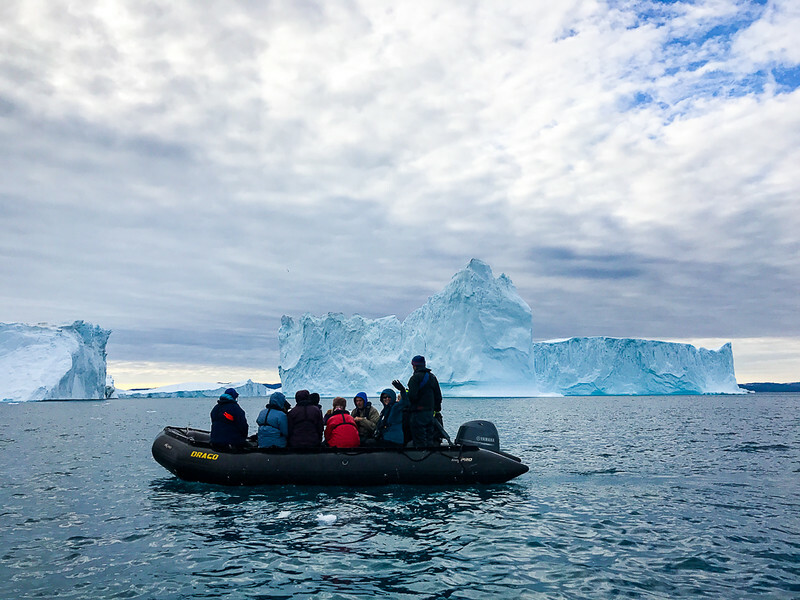 A zodiac of excited travellers enjoying the icebergs of Ilulissat. The icebergs are white at the top. This is a sign that they contain more oxygen. The darker blue colour indicates less oxygen and denser ice. What I found most incredible is how they look different from every angle and in the changing light. Just as with the whales we kept a safe distance with the icebergs. 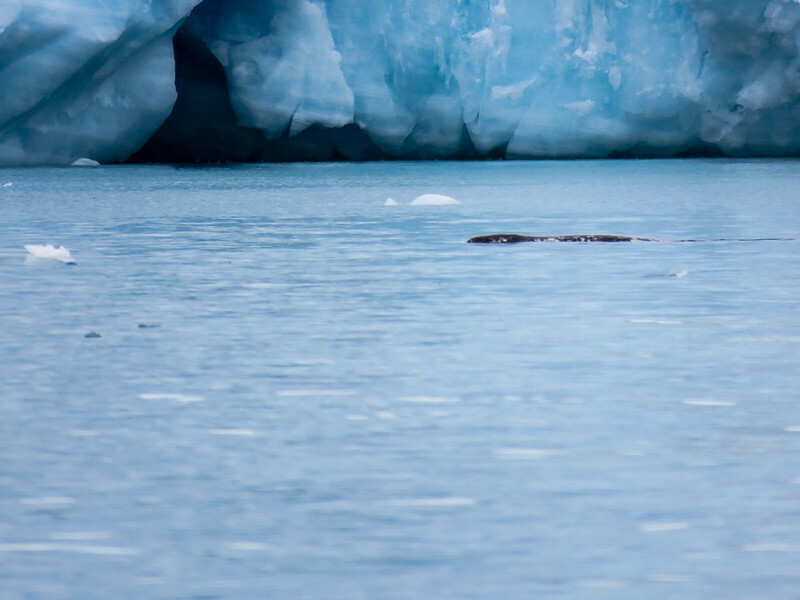 If a huge chunk of ice falls off, it can cause a tsunami of 20-metre waves – causing havoc on a zodiac. The famous icebergs of Ilulissat. In a world where everything seems to be going to hell – at least according to the news, this morning everything seems to be right. I’m one with Mother Nature, at peace. After the most incredible zodiac ride of my life, we head to shore to the town of Ilulissat. It’s a 1.5 km walk through town past cafes and gift shops to reach the boardwalk. From there it’s a 1 km walk to arrive at the Sermeq Kujalleq Glacier. Spotting humpback whales were one of the highlights of our trip. If there is such a thing as Iceberg Prison, this would be it. Massive chunks of ice remain trapped on the shelf. They’re held to the land until they melt enough. Then they’re freed into Disko Bay. And no I did not make that name up – that’s what it’s called. From land, the icebergs look different. You can see the crushed ice and icebergs crushing up against each other. Occasionally you hear large pops that sound like gunfire – the sound of icebergs moving or breaking off. 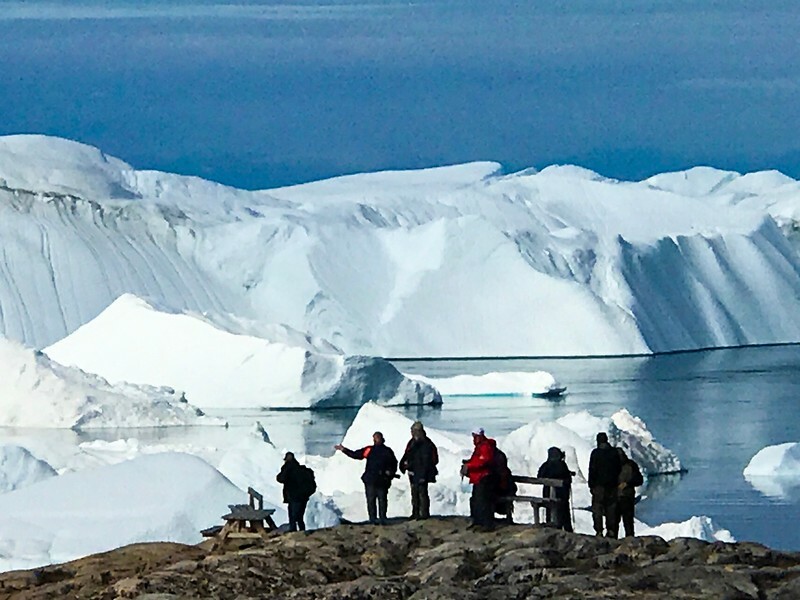 Members of our expedition enjoying the spectacular views of Ilulissat. I expected them to be noisier, but perhaps it depends on the day. We had several hours of cherished free time in Ilulissat. Most travellers return on the boardwalk the same way they came. Then head to a café. Caribou burgers or Muscox hot dogs are on the menu. I tried a Muscox hot dog, and it was good – much less gamey than I’d anticipated. Souvenir shops lure visitors in with local crafts. You’ll find hand carvings and jewellery from caribou antlers, walrus ivory (which can’t be brought back to most countries so don’t buy it)and seal skins. Me enjoying the views of Ilulissat. Instead of shopping, I do what comes more naturally. I hike. Upon arrival at the boardwalk, I almost squeal with delight when I see the description for a 6.9 km hike. That was in addition to the 2.5 km that I’ve already done. While the end of the boardwalk is full of visitors – mainly from our boat, the crowds thin out considerably as I follow the blue trail along the banks of the icefield. I am alone. Crack, pop. Without the distraction of human voices, I can hear the icebergs more clearly. They seem to be talking to me alone. I stop to smile. A fly promptly makes its way into my mouth. Several attempts later I spit it out. Extra protein is not on the menu today thank you very much. Note to self: smile with your mouth closed. The hike in Ilulissat is one of the most spectacular that I’ve ever done. I climb over the rocks. Each step I take leads me closer to euphoria. Crack. Pop. Bang. If there’s a heaven on earth surely, it’s here. 2:45 hours later I reluctantly make my way back to town. But the grand finale is the Greenlandic sled dogs who are on summer holidays. I hear them before I see them. Their howl sounds eerily similar to a wolf howling at the moon. They blend in with the light coloured rocks that they lay on. They’re all on chains, so I know that I’m safe. They look friendly, but we’ve been warned numerous times never to pet them. They’re wild and only friendly with their owners. Two more turns and I’m reluctantly back in civilization. I see a few members of my group at a café. That’s where I try a muskox hotdog. I’m slightly disappointed that my adventurous choice tastes so normal. Tonight is Disco Night on board. I stop in for a few minutes but leave as nobody is dancing. Apparently, that happened later. Somewhere between 9:30 and 10:30 pm. By 10:30 it’s all over. It’s an older but fascinating crowd on board. Everyone has a story and is leading interesting lives. Today we travel along Greenland’s second largest fjord. It’s a quieter day than the previous days. We’ll be on board until 2:30. We have a choice of attending informative talks in the morning ranging from Arctic Mammals to Arctic Birds to a talk by a photographer. Eight mummified Greenlandic Inuit were found in Qilakquitsoq. We also attend the mandatory polar bear briefing which makes my heart sing. It means we’re getting far enough north that seeing a polar bear is a possibility. Not today I’m told and not likely tomorrow, but it could happen. At 2:30 we depart in the zodiacs to the cloud-shrouded Qilakquitsoq. It’s a fittingly eerie atmosphere to what is essentially a large unmarked cemetery and one of the most important if not the most important archaeological site in Greenland. Eight mummified Greenlandic Inuit were found here in the 1970s. They’ve been carbon dated to 1475 and removed. Now all that remains to the untrained eye like mine is a cairn of rocks. There are 58 burial caches, but they’re all unmarked. We each point out and speculate potential burial sites. The Greenland government has decided not to explore further unless the site is in jeopardy of being destroyed. More questions than answers remain in this mysterious place. You can find out more about the Greenland mummies here. The fog continues to roll in. We’re scheduled to stop at Karrat Fjord. We’ll be free to explore in our first polar bear monitored area but within the border of the polar bear monitors. Each of them has training in polar bear safety, including the psyche of polar bears. However, due to heavy fog and icebergs in our landing spot, it’s not possible. Karrat Fjord is also the area where just several weeks before was tragically hit by a tsunami with 100-meter waves caused by a landslide. As a result, one community has been permanently evacuated. Four people are presumed dead. The residents will likely never return due to the high costs. We take a moment of silence for the victims and send silent prayers to the survivors. You can read more about the tsunami here. It’s time to choose a new landing using a combination of sea maps and Google Earth. We’re going to a place called Savit. It’s real expedition style. No one on board, including crew, has been here before. We don’t know what – or who we’ll find there. After a 5-minute ride on the zodiacs, we disembark on a black sand beach. Yes, such a thing exists in Greenland! We can explore on our own along the flat coastline or head up along the coarse sand. Naturally, I head up. As lovely as the ship is, my legs are crying out for hills. I go as far as I can before heading downwards. A fellow passenger has told me there’s a muskox skeleton. Along the way, I spot flowers growing in the sand. I imagine their tenacity for surviving in a place where it seems impossible for anything to grow. Arctic wildflowers are incredibly resilient. This remote place is soul-stirring. It’s moved me in ways that I have yet to discover, but I know it’s touched me. I’m slightly worried about seasickness. When you look at it on a map, you can imagine that the 650 km crossing could be quite treacherous. Fortunately, my worries were unfounded. At least on this trip. So what do you do when you have a whole day at sea? There’s a variety of educational lectures offered. Some guests sip coffee and read in the Compass Room. All guests are encouraged to spend as much time as possible on the top deck on the lookout for wildlife. And the really ambitious ones head to the gym for a workout. But mainly we eat. And eat. Despite it being a sea day the day is enjoyable. I don’t hear a single person complain of boredom. Adventure Canada knows how to entertain. Me enjoying the Arctic scenery. Today we visit Pond Inlet. Our first stop in the Canadian Arctic. We’re told that the community looks very different than the ones we’ve visited in Greenland. And it does. In place of the brightly coloured wooden houses in Greenland, the buildings seem drab and shabby by comparison. The community of Pond Inlet was very welcoming. But also upon arrival, I notice another difference. I feel welcome. I feel that the locals are genuinely glad that we’re there. In Greenland, I felt more that I was more of a minor annoyance. To be fair given the number of ships they receive, I probably was. We do a tour of the community which has about 1500 residents. Alex, our personable guide tells us that most people are out fishing and camping. As we walk along, we see a few children riding their bikes. They are curious and approach us. Alex seems to be related to almost everyone we meet. I ask her about dating. She tells me that she’s been single for a long time. Then quips with a gleam in her eye in what I’m learning is trademark Inuit humour, It’s much easier if you’re open to dating your third cousin. There’s a cultural show where we see a demonstration of Inuit Games. I feel seriously unfit but vow to practice Inuit style when I’m back home. Word on the street is that there’s a Tim Horton’s at the Northern Store. Me and two others slowly make our way there. We’re early. It’s Saturday and doesn’t open until 1:00 pm. Several people pass. Each person says hello and lets us know the store doesn’t open until 1:00. Despite the rather drab first impression this community more than makes up for it with its spirit. I ask one passerby if they ever see whales in the inlet from town. We saw a group of 200 – 300 Narwhals yesterday, he casually replies to my jaw-gapping shocked face. That’s why everyone’s out hunting. Quotas control whale hunting. Each community is given a quota and can’t go over it. Although I’m against whale hunting, when I see how little else there is to eat, I need to reconsider my position. I’ve been rather judgemental without understanding the reality of surviving in the Arctic. Polar bear observing us observing him. Back on the boat, we’re encouraged to be on the lookout for wildlife. This part of the Canadian Arctic is THE best place on the plane to spot Narwhals. Deanna, the whale expert on board, spots a Bowhead whale 700 m away. No one else sees him. Then THE announcement we’ve all been waiting for comes over the speaker. There’s been a polar bear spotted about 1 km ahead. I bundle up in all the clothes I have – the Canadian Arctic has been chillier than Greenland, grab my camera and head to the bow. He’s on an ice floe (floating sea ice that’s not attached to land) straight ahead. We look. We look again. Nothing. Then someone spots him again. There’s a collective cry of He’s not white but yellow. I’m also surprised that he stands out on the ice floe. He doesn’t blend it as well as I thought he (or she) would. But apparently, it’s enough to still sneak up on the seals that they prey upon. A polar bear paces up and down on an ice floe. He walks left across the ice flow. He sticks his nose in the air. He’s caught wind of us but isn’t worried. He’s the mighty hunter of the north. At the top of the food chain except for us. And we’re not there to hunt him. 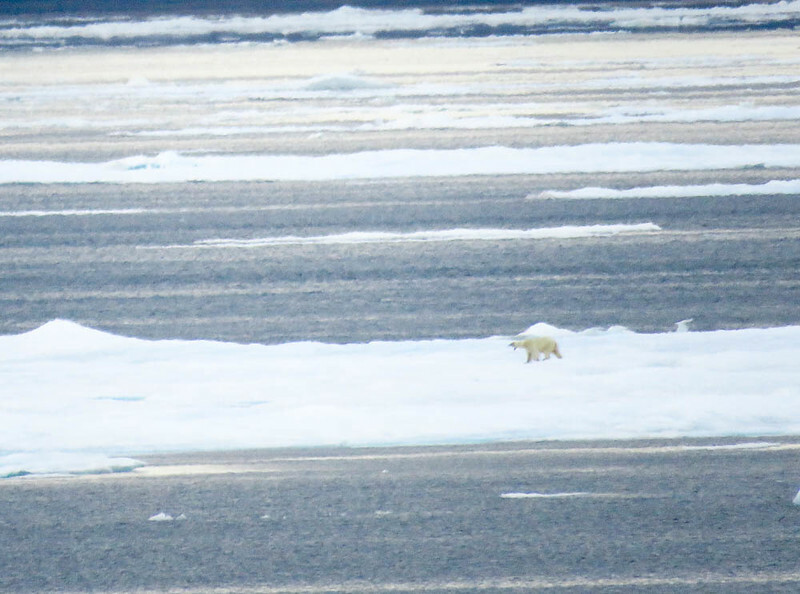 He turns back and walks right before disappearing off the floe and into the brisk waters of Baffin Bay. We’re sailing in the morning. It passes by with more educational talks that spark conversations in the Compass Lounge over cookies and tea. I break it up with intermittent sessions of going to the top deck looking for wildlife and spot a herd of ~ 500 Harp Seals. Despite their numbers, they’re tricky to photograph. By the time you focus on their head just popping out of the water, they’re down again by the time you click. If I didn’t know better, I’d think it was a game for them. One that they’re winning. We disembark to Cape Hay, a headland on Bylot Island famous for its Thick-billed Murres and Black-legged Kittiwakes. It’s part of the Bylot Island Bird Sanctuary and is deemed a significant site under the International Biological Programme. I’ve forgotten my binoculars which was a huge mistake. It’s one of the many times on the trip that I wanted them to observe the birds up close. I’m SO excited for today – two outings. One in the morning and one in the afternoon on Devon Island. Not only is it the largest uninhabited island in Canada, but in the entire world at 55,000 sq km. It’s like a Mars on earth. NASA has been conducting research there for two decades. A hiker approaching the abandoned RCMP Outpost. There’s an option of three hikes of varying lengths and difficulties. I choose the longest one. It’s only ~ 6km and not all that hard. But it ends up being one of my favourite outings on the entire trip. Dundas Harbour. Can you spot the fox? We trudge up a slight hill to reach the abandoned RCMP Outpost first established in 1924 by three constables. The supply ship only came once a year. If for some reason it couldn’t get through, the officers would end up unexpectedly spending another year here. They’d be living off the sea and the land with no provisions. That would mean a monotonous diet consisting of mainly whale and seal meat. Abandoned RCMP Outpost on Dundas Bay. For the first three years, there was no radio contact. News and letters from loved ones only came once a year on the ship. Two constables died there. One committed suicide in the spring, just a few months before he was due to go back south. Another accidentally shot himself while trying to hunt a walrus. Near the outpost is Canada’s most northern graveyard. Life was anything but easier way up here. Even from the brief time I spent there, I can see how depressing life must have been – especially during the cold dark winters. Rumour has it that two constables hated each other. Can you imagine being stationed in confined quarters with someone that you hated? You can read more about the RCMP Outpost here. Gyr Falcon. The largest falcons in the world. Bones litter the beach in front of the outpost. Many of them are seal bones. It’s prime polar bear habitat. I spot an Arctic Fox ~50 meters away. He notices our group and stares in our direction. He’s just as curious about us as we are about him. It’s hard to tell who’s looking at who. We continue following an assigned Polar Bear Monitored. He’s trained in polar bear safety and is carrying a loaded gun. Although no one wants to shoot a polar bear, you don’t mess with them. This Arctic fox was just as interested in us as we were in him. A kilometre or so later, two white spots stick out like a sore thumb on a rocky outcrop. Arctic hares. Unlike Arctic foxes which turn brownish, they remain white. It seems like a treat for their predators but rather unfair for the hare. 100 m away we come across a pair of Gyr Falcon, the largest falcon in the world. Their wingspan can reach widths of up to 134 m. Through a scope I see the female eating something red – perhaps a fish she caught. The hares are safe. At least for the time being. 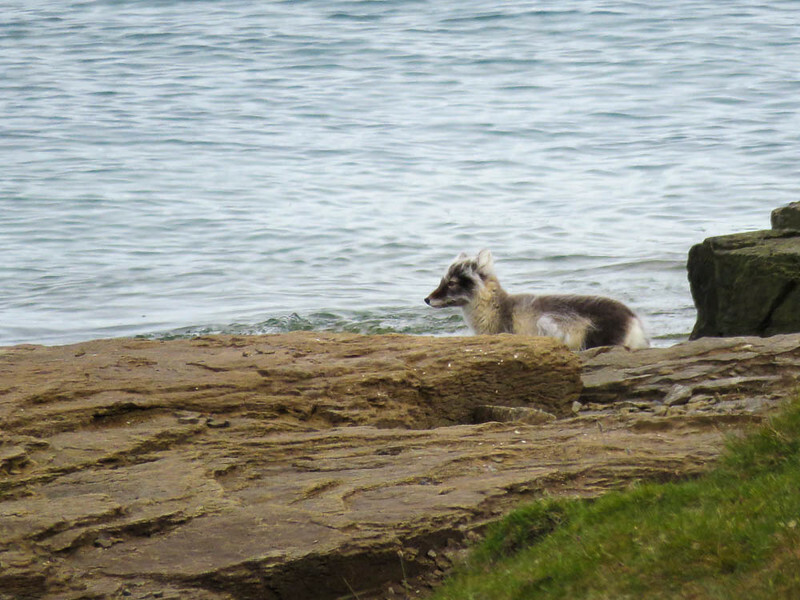 A bit further on I spot another Arctic Fox. This one appears to be in the middle of lunch. But his curiosity getting the best of him, he stops to observe us. It’s possible that we’re the first humans he’s ever seen. One of the advantages of living on an uninhabited island. A few minutes further, there’s another Arctic Hare. I’m surprised at how much larger it is than hares further down south. It’s cheek pouches appear to be resting on the rocky outcrop. It too seems oblivious to the Gry Falcons that could swoop down and end its life within seconds. A seal is spotted poking his head up just off the shore. Hare. Seal. Hare. Seal. It’s hard to know where to look. It’s a naturalist’s dream. After lunch, we make our way to Croker Bay. It’s famous for the protruding Devon Ice Cap which covers 12,000 km2 on Devon Island. Startlingly beautiful ice with giant crevices reaching down to touch the bay. It greets us with a loud gunfire sound – the sound of ice breaking off. I don’t see it, but I hear it. 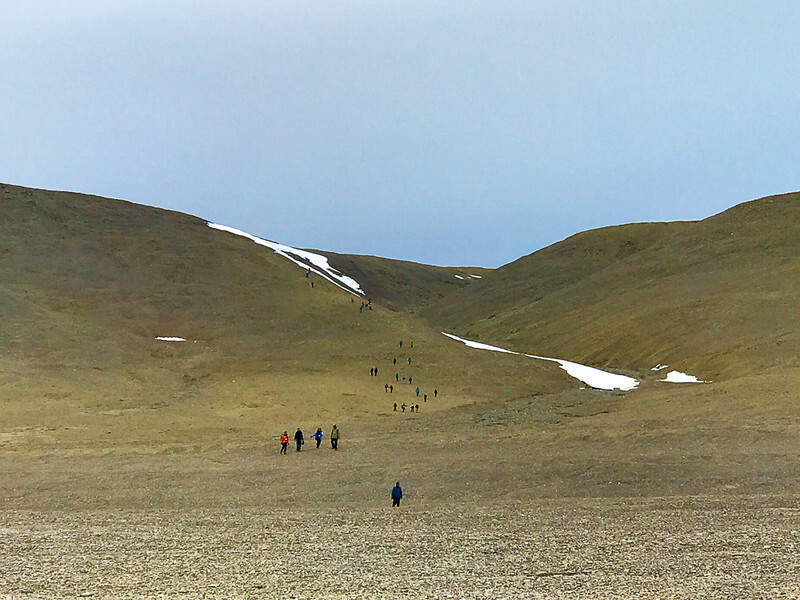 We explored the Devon Island Icecap by zodiac. Over the radio, I hear the other word everyone has been anxious to hear. Narwhal. First one is spotted. Then another one. There’s a small pod close to the glacier front. 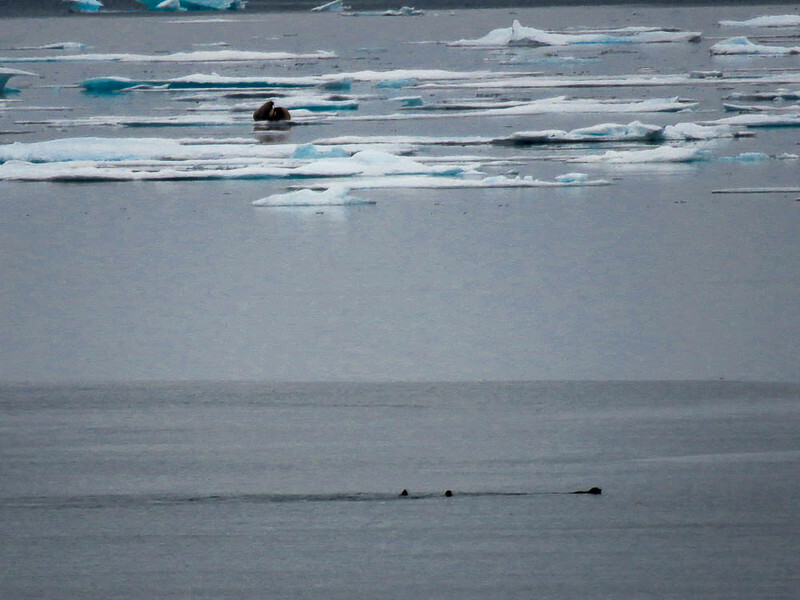 From my perspective, they seem to be swimming directly under the glacier. The back of a Narwhal. They look like long graceful logs slowly floating along. You can’t see their infamous tusks. Those only make an appearance outside of the water when they’re mating. And it’s usually only the males that have the tusks. One Narwhal takes a breath slightly revealing her spotted back. It reminds me of a seal more than it does a whale. I take a deep breath and take it all in. Few of the expedition staff have ever seen a Narwhal despite spending time in the Arctic. It’s a rare occasion. One that I full heartedly relish. Back on the ship, I’m giddy with the excitement of the wildlife sightings. Then I hear the announcement. A polar bear. This one is on land. He’s easier to see as he contrasts with the brown rocks he swiftly crosses. He appears to be moving slowly, but it’s rather quickly when you see how much distance he covers in a short time. Note to self: don’t try to outrun a polar bear. The first and only polar bear we saw on land. It starts with good news and bad news delivered almost simultaneously across the speaker system that’s become my alarm clock. The bad news? We won’t be able to land in Maxwell Bay. The ice is too thick. We can get in for the planned excursion. But we may not get out. I sigh, aching to get on land. I’d signed up for the 12 km hike, one of the longest hikes on the trip. It ends up being a sea day which means a day of gluttony – unless you have extreme willpower – which I don’t. The onboard programming entertains us. It’s making me realize how little I know about the Arctic. The good news is that someone has spotted walruses. From the announcement, it sounds like I have enough time to brush my teeth and splash my face with water. I do so before dressing quickly and making my way to the top deck. I see a brown blob. As we slowly inch forward, it becomes two brown blobs. Walruses like to cuddle on ice floes after diving in icy waters for crustaceans. Seriously, it’s even cuter than I imagined it would be. As we inch towards the walruses, the two blobs start to take more shape. One hides behind the other. Occasionally he lifts his head, and I see his tusks before he snuggles into his buddy again. I wish I was a walrus for a few moments. Then I remember how wimpy I am when it comes to the cold as I nestle further into my fleece. Someone spots a seal. But those sneaky buggers are hard to photograph. They pop their heads up but have disappeared again by the time you’ve focused your camera. We cruise by Prince Leopold Island famous for the Prince Leopold Island Migratory Bird Sanctuary It’s the second largest breeding area of Northern Fulmars in Canada. It’s also an important spot for Kittiwakes, Thick-billed Murres, and Black Guillemots. 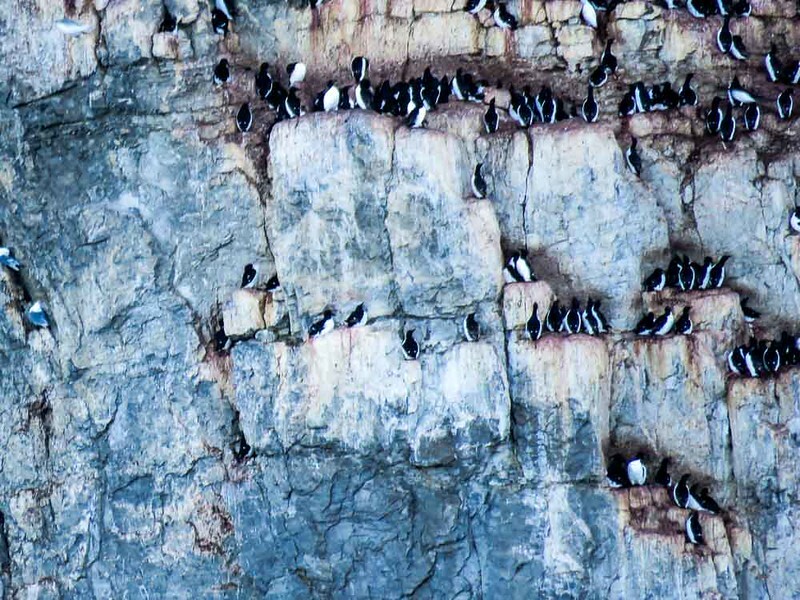 The vertical cliffs reach 265 m from the water and host up to 200,000 breeding birds. It’s like a bird high rise in NYC. Birds nestle themselves close to their neighbours on whatever small cliff space they can find. It’s chaotic. And loud. And utterly delightful. Beechy Island is one of the most historic sites in the Arctic. Although it’s only 2.5 km across, it overlooks an important intersection used by High Arctic Sea Farers. For years it was also thought to be the location Sir John Franklin’s expedition because of the presence of the first relics of evidence and three graves. Forty teams searched for the disappearance of Franklin’s expedition. Beechy often served as a base. The remains of the building built to shelter the expeditions searching for Franklin’s men. We now know that some crew spent two years on Beechy Island. We land at the grave site which are replicas. The originals are now in a museum. I’ve chosen the long hike again. The trudge begins up a steep scree slope. It’s not long, but my calves start to feel the familiar burn. 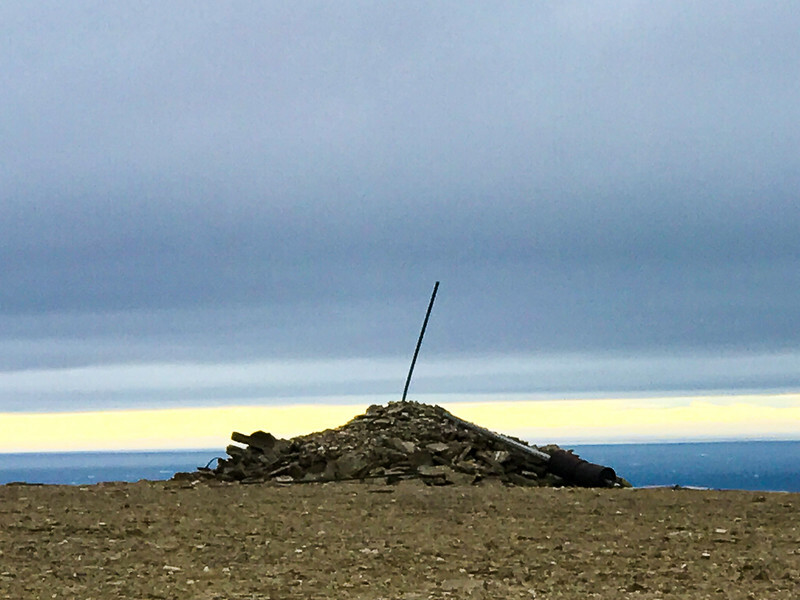 At the top, there’s a large cairn that Franklin’s men built to send messages to passing by ships. It’s a bleak, barren and unforgiving windswept place. There’s little vegetation. Summer temperatures don’t consistently reach the 5C required for most plant life. As my feet crunch along the rocks, I imagine that the crunch is the sound of bones. The bones of Franklin’s men. It’s a morbid thought, but that’s what this place brings out in me. Two hours on the island is enough for me. How did these men survive two years? Freezing temperatures, winds that chill to the bone. Little to eat. With polar bears trying to eat you. I was there in 3C and ready to leave, let alone -30C. I leave feeling depressingly grateful. Depressed for the men who succumbed there. Grateful for the opportunity to visit one of the most historic places in the Canadian Arctic for European explorers. It feels wrong to end this trip on a sombre note. As I’m packing up my stuff, my mind simultaneously thinking about nothing and everything I’ve experienced, I hear the announcement, someone has spotted a polar bear. It’s the closest sighting to date. You can see him curiously glancing at our ship, then falling back asleep. He’s aware of our presence but knows he’s the king of the Arctic. I see his different facial expressions. The fat folds in his cheeks as he turns his head. I just want to pinch them as you would a small child. He’s a healthy bear with ample fat stores – a sign of successful seal hunting. We later learn from our polar bear experts that he is actually a she. She’s pregnant. Her additional bulk made it easy to mistake her for a male. Given all the challenges that polar bears are facing it’s uplifting to see one thriving. Then, it’s time for the ultimate adventure – the polar plunge! Willing participants jump into the frigid Arctic waters. I’ve forgotten my swimsuit but not wanting to miss out, I participate in my gym clothes. There’s ~ 40 of us – the rest of the passengers think we’re nuts. I share their opinion. We line up in our bath robes, taking them off at the last moment. The frigid Arctic air chills our skin. Back in my bathrobe, I warm up surprisingly quick. I head to my room for a hot shower. I’m surprisingly warm. And energetic. I feel like I could run a marathon. I feel alive. More alive than I’ve ever felt. There are two flights from Resolute Bay. I’m on the second one. We wait. And wait. The fog is thick. Bad weather has resulted in a delayed flight. At least we have the comfort of the boat instead of waiting in the bare bones airport. I take the time to reflect on the trip. I’m grateful for my Arctic Adventure. I know it’s changed me, but I don’t know how just yet. I can’t wait to find out. Stuffed polar bear at the airport in Resolute Bay. I thoroughly enjoyed travelling with Adventure Canada. It’s one of the travel highlights of my life. Travellers who are curious, interested in natural history and want to explore will love this trip. However, it’s not for everyone. If relaxing on a cruise ship with nothing to do but read the latest summer read is your ideal vacation, you won’t enjoy it. While there is time to relax and all the activities are optional, this is an active vacation that encourages exploration and curiosity. You also need to be flexible. Icebergs and ice floes are unpredictable and can wreak havoc on your plans. There was one day I was really looking forward to a 16 km hike (shorter options were available). We ended not getting off the ship at all that day. Adventure Canada does an excellent job with their onboard programming, but admittedly it doesn’t provide the same thrill as exploring on land. The unknown is a given on this type of trip, so you have to accept that plans change. I especially enjoyed the land excursions since they usually included different options where you could choose activities of varying levels of difficulty or have free time to explore on your own. I also loved the wildlife sightings and the opportunity to explore one of the remotest regions on the planet. It felt like such a gift. Adventure Canada does an incredible job with their diverse array of experts. They’re knowledgeable and full of entertaining stories that know how to keep you entertained both on and off the ship. Adventure Canada is a leader in eco-tourism which is extremely important to me. World Wildlife Fund chose to partner with them. That’s one of the best endorsements you can get. Also, I appreciated how accommodating they were for celiacs (and other food allergies/preferences). Both the breakfast and lunch buffets were labelled making it easy to know what I could and couldn’t eat. The waiters were knowledgeable at dinner. Finally, this Arctic Safari is a great trip for solo travellers. I was alone but never felt alone. This trip attracts people who are open to meeting others. There were many solo travellers on board. I loved my Arctic Safari so much that I’ve partnered with Adventure Canada to offer it to you. Something I only do if I think a trip is incredible You can find more details on the Arctic Safari here. And if you have any questions, let me know. I’m happy to help determine if an Arctic adventure is the right trip for you. Narwhals, arctic foxes, walruses and polar bears! What an amazing 12 days! @Izy - It truly was a fantastic trip. Can't recommend it enough. Man this looks truly epic! I was just in Greenland at around the same time as you, but I was only in Nuuk and the surrounding fjords. Wish I made it up to Ilulissat! Your pictures remind me of Svalbard in the Norwegian Arctic - I went on an expedition cruise that circumnavigated the island and we saw so much wildlife. I would love to explore the Canadian Arctic in future too. @Nellie - It truly was epic and I loved Ilulissat. Would definitely love to return to Greenland and explore Nuuk. I haven't been to the Norwegian Arctic but that sounds incredible too. Thanks, Len. Hope that you enjoyed it as much as I did! Talk about a once-in-a-lifetime adventure ... loved all the photos! @Henry - It was my dream as well. Really wanted to see a polar bear and got to see three. Can't recommend it enough. If you have any questions let me know. I'm happy to help. Loved this article - very thorough and the arctic dogs rock! Wow.. All I can exclaim is wow.. getting an opportunity to see the arctic animals in its own habitat is priceless and truly your words reflects that..